Designed for sharing any moment, capture everything you love with the new entry-level Nikon D3500. Take your photography to the next level and enter the world of DSLRs with the new DX-format D3500. This is the perfect camera for capturing priceless moments in any setting with its 24.2 megapixels and EXPEED 4 image-processing engine. A simplified ergonomic design, coupled with SnapBridge functionality, makes it easier than ever to shoot and share your favourite images on social media. The new Guide Mode gives you quick and easy tips to help you master the basics of the D3500, so you can learn to capture great shots in any situation. 11 autofocus points will also help keep your subjects in focus. Long battery life ensures your outings are never cut short, with approximately 1200 frames per charge. With an ISO range of 100-25600, you can create beautiful nightscapes with the D3500. In fast-paced settings, the 5 frames per second shooting speed (approx) makes capturing all the action a dream. Full HD video recording in 1920×1080/60p makes this DSLR a great choice for those looking to capture and create dynamic videos. The D3500 is designed with a ergonomic body, making it slimmer and comfortable to hold at approx. 390g in weight. With fewer buttons and more intuitive controls, it’s the hallmark of simplicity and high usability. With a constant Bluetooth® connection and remote shooting capabilities, SnapBridge gives you extra flexibility and efficiency when transferring images1 to your smart device. Image retouching and editing functions will give your photographs a huge creative edge. Get closer to perfection with the AF-P DX NIKKOR 70-300mm f/4.5-6.3G ED VR. As a telephoto zoom lens, capture your subjects from afar with minimal aberrations thanks to the Extra-low Dispersion glass element. Highly accurate autofocus allows you to shoot quickly and quietly with minimum fuss. Additionally, the Vibration Reduction technology helps to stabilise any shots that might be affected by camera shake. Enjoy unparalleled versatility with the compact and lightweight AF-P DX NIKKOR 18-55mm f/3.5-5.6G VR. With easy handling and portability, this lens will allow you capture your desired shots quickly and quietly. Vibration Reduction with the lens also ensures a sharp image, even when photographing fast moving objects, so you never miss the perfect moment. 1. Unless otherwise stated, all measurements are performed in conformity with Camera and Imaging Products Association (CIPA) standards or guidelines. All figures are for a camera with a fully-charged battery. The sample images displayed on the camera and the images and illustrations in the manual are for expository purposes only. Nikon reserves the right to change the appearance and specifications of the hardware and software described in these specifications at any time and without prior notice. Nikon will not be held liable for damages that may result from any mistakes that these specifications may contain. There are no images to show for the D3500 just yet. 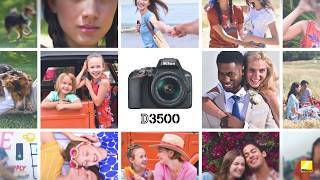 The D3500 is available in stores with a 2 Year Manufacturer Warranty.